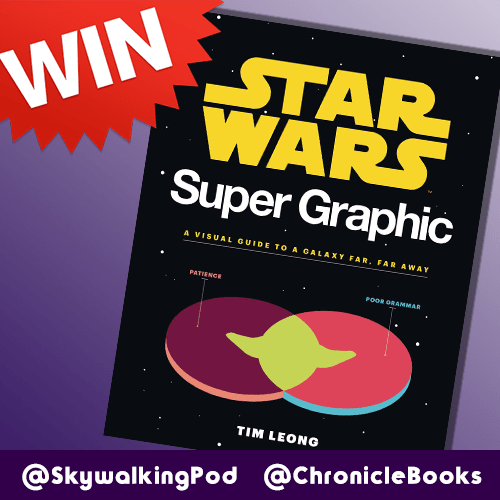 You could win a copy of Star Wars Super Graphic by Tim Leong! On Episode 181, we gave this book a glowing review. On Episode 182 we had the pleasure of talking with the author all about the making of this amazing book. Now you can win a copy! Take a selfie. Tweet it out using #SkywalkerSelfie @SkywalkingPod and @ChronicleBooks. Tell us why you like listening to Skywalking Through Neverland. We will also make sure you’re following @SkywalkingPod and @ChronicleBooks. This contest is eligible for US and Canada residents only. Ends Tuesday, 9/5/17 at 10:30am and winner will be announced on Episode 183.